We haven't done any sailing for almost two months now. I think we missed the best part of the year for being out on the water but life has a habit of getting in the way sometimes. So it goes. I have found time to get some work done on the dinghy hoist though. We used the rig several times and I came up with some ways to improve the operation. It's slowly but surely evolving into a workable system. My neighbor at the dock has seen me playing with it and thinks it's overly cumbersome but each time I use it I work out the kinks a little more, the launch and retrieve times shorten a bit more and the whole operation gets a little easier. Besides all that, I'm having fun with it. These two shots show the first and second iterations of the derrick. In the first picture above you can see the basics; the spare halyard pulling up on the end of the pole and the 6:1 block and tackle. The point where they meet at the end of the pole I have what I call a "double D" ring. 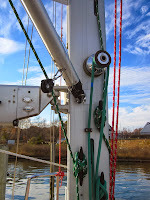 The pole clips onto the bar in the center and now the fitting takes all the pressure of lifting and the pole simply serves to hold the line out from the mast. The second shot shows the improvements. A third line, the tether, now connects to the Double D ring at the center bar and acts to pull the end of the pole side to side, directing the location of the dangling dinghy. This also adds some stability on a windy day. In addition, the line coming off the block and tackle now runs along the pole back to the mast. Now every action for operating the derrick is done from one spot at the mast pulpit. Sweet! One of the biggest problems I had was using the mast mounted winch to hoist the derrick with the spare halyard, especially under load. The halyard exits the mast below the winch, runs down to a block at the base of the mast and then runs up to the winch at a bad angle. As you crank the winch the line wrapped over itself on the drum, got knotted and everything ground to a halt. 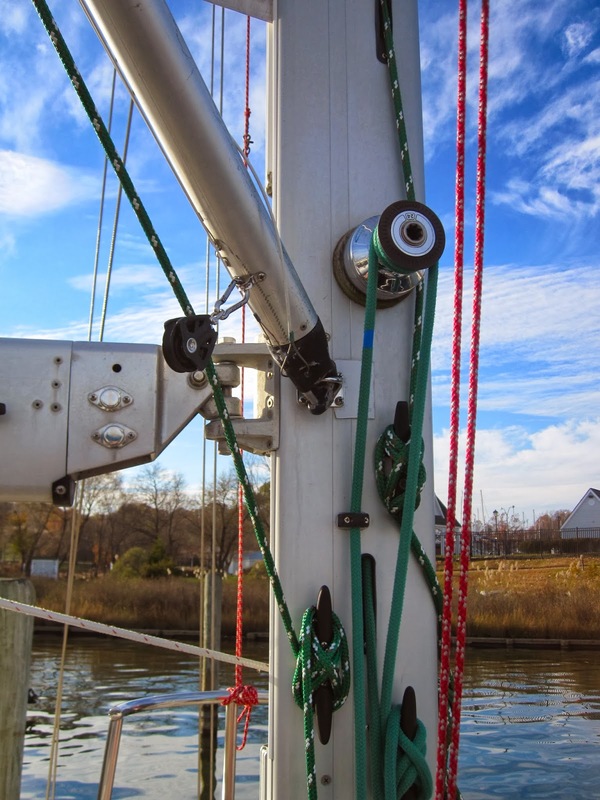 I added a fairlead (picture at left) on the mast between the block and the winch so now the line feeds onto the winch at a better angle and wraps as it should. That's one headache out of the way. The tether runs from the double D ring to a block at the base of one of the life line stanchions just forward of the shrouds (the standing rigging on the side of the boat). From this block it leads up to the mast pulpit and I can swing the derrick back and forth from there. 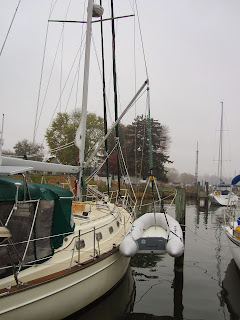 I can raise and lower the pole using the spare halyard or I can raise and lower just the dinghy using the block and tackle. I've found that if I raise the derrick to a 45 degree angle I can use the block and tackle to do all the lifting by hand (much easier) instead of cranking on the winch. The line for the block and tackle is 100' of 7/16" double braid Sta-Set. I use a snap shackle at each end of the block and tackle and also on the end of each line where it connects to the derrick to make set-up and take-down a....uhm....well...a snap. 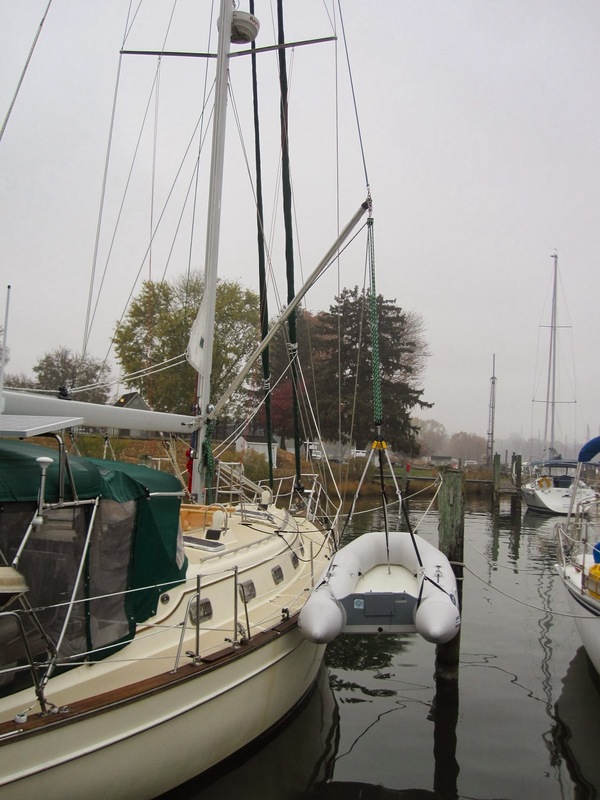 I also added two cleats on the mast to tie off the hoisting lines and I use the mast pulpit railing as an additional spot for tying off the tether. One other line I use is attached to the hand rail on top of the cabin on the port side. I run it from there to the ring on the bow of the dinghy and then back to the rail, giving me a 2:1 advantage. This line is used to pull the dinghy onto the cradle located beneath the boom. The whole operation really flows with two people but if Cheri's busy mixing up Tequila Sunrises then I can usually manage by myself. The final part of this game is the cradle where the dinghy is stored when not in use. 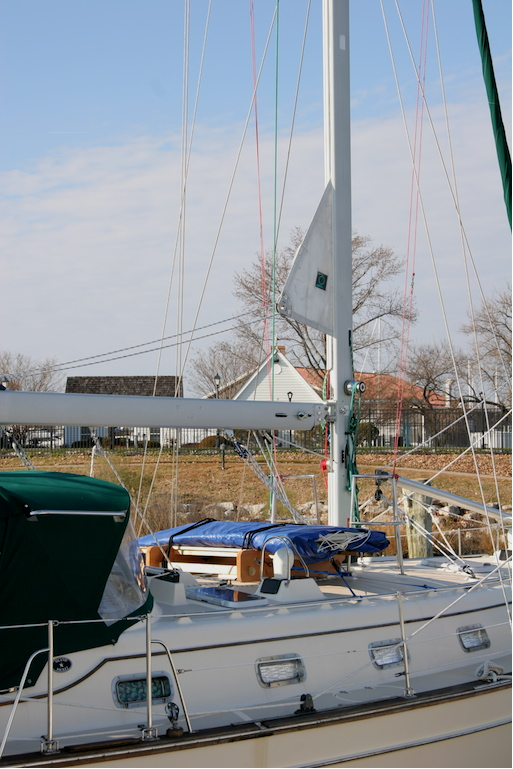 Most folks use davits and hang the dinghy fully inflated off the back of their boat. I didn't want to do this for two reasons; it blocks your view out the back of the boat and it's not a safe storage spot when you're under way in following seas. I chose instead to store it in a cradle just aft of the mast. It can't be stored here inflated because it'll block your view looking forward so we have to pump it up when we want to use it. That's the one big trade-off with not using davits. It's also a good excuse to buy an electric pump. Or maybe an air compressor we could also use to fill the scuba tanks. Oh yeah! Now we're onto something! When we went to Bermuda I simply used a couple of 4x4's laid on either side of the main salon hatch and tied the dinghy down on top of that. This works well but you can't open the hatch and it blocks all the light coming through to the salon. I needed to raise it up so we could use the hatch. I also needed to make a frame the dinghy could slide onto when being pulled onto the cradle. I looked around at different designs and ended up combining several that I thought were kinda nifty. I usually work up the design on paper first to get a feel for how well it will work. The final look is important too since it'll be sitting out in the open for all to see. Next I make full scale templates in cardboard to get a better feel how it'll look in place and to make sure the final version won't interfere with anything. Once all the bugs are worked out I use the cardboard template to mark the wood for cutting. Last Saturday I cut out all the pieces for the cradle. I used 5' long 1"x 2"s and glued and screwed them together to form a "T" when looked at from the end. These will be the skids that the tender will slide on when being launched or loaded from either side of the boat. 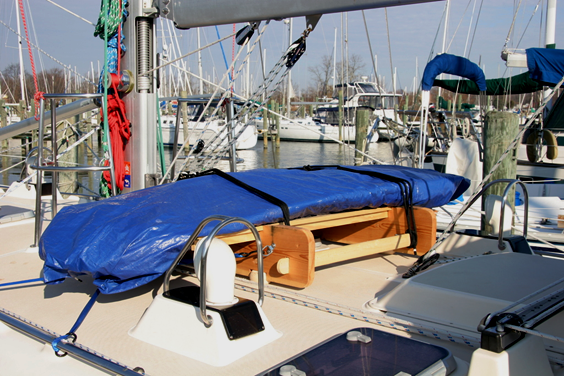 They'll eventually be covered with bunk carpet which is a soft, rug-like material to prevent scratching up the fiberglass on the dinghy. The skids are mounted on two end pieces made from 4' long 2"x 10"s, forming a rectangular frame. I cut the end pieces out with the profile of the bottom of the tender so it'll sit down level and snug and be lower to the deck. I had wanted the cradle to sit high enough to be able to raise the hatch to the main salon to give us more light and air down below. I tried putting feet under the frames to allow water and air to flow freely underneath but when everything was assembled I found the whole thing sits too high for my liking. Need to give this some more thought. Plan B. I came up with some real convoluted ideas on how to accomplish what I wanted here. Stainless steel tubing and fittings, airbags and compressors. In the end I went with "simple". To lower the frame down a few inches I recessed the feet into the frame using a 4" hole saw. It now fits down nice and snug but still allows the hatch to open enough for some light and airflow. I used 1"x 2"'s down low on the sides for stability and to provide a place to tie things down to. I have some ratchet straps attached to the hand rail on top of the cabin and they do a nice job of holding the thing in place. They're kinda chintzy though, not exactly what I want but they'll do until I come up with something better. When I loaded the dinghy onto the cradle the whole operation went so smoothly I couldn't believe it. It just slid right into place. I think I've gotten most of the bugs out of this system now and I'm finding it to be a pretty simple operation. Probably more involved than simply hanging the dinghy off some davits but this is a better way for us all around. Our view won't be blocked, fore or aft. We won't be tempted to keep the dinghy hanging off the stern and have to deal with it in bad weather or high seas. It might even turn into a good spot to take a nap up on deck. Looks pretty inviting to me. So now I need to find some decent weather to sand and paint this thing and she'll be done. Well, almost. In this older picture with the 4x4's the dinghy is in a storage bag that came with it when we bought it. That bag did not survive the salt water test of our trip to Bermuda. Even though I washed it thoroughly it slowly disintegrated over a few months. I'd like to make something similar using a good sturdy canvas and run a zipper around three sides. Probably make it green to match the Dodger and Bimini. Add some heavy duty loops for handles and tie downs. And, uhm, maybe waterproof it too. This has been quite a project. Total cost was about one fourth of what I would have paid for davits with most of the expense being for the used spinnaker pole, the double D ring and the 6:1 block and tackle. It's taken some time to work out the bugs and make it a workable operation. But I think we've got it figured out now and have something that'll work for us very nicely. Nicely done, Tom. Looks like it works smoothly and easily now.